When I was in San Diego, I was quite succesful at making contacts to sell some of my own Dutch strip series to American publishers. So succecful even, that I didn't have time to get out another Dutch strip, i had prepared earlier. 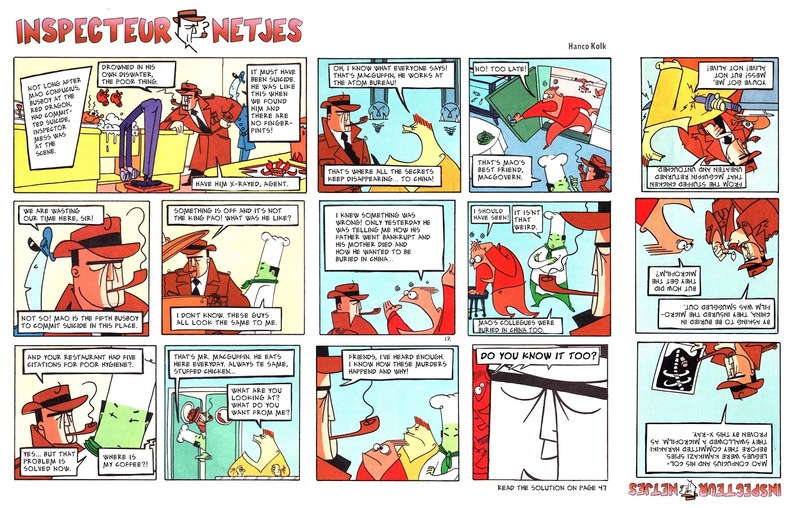 Elliot Mess is my own translation of an older Dutch strip by Hanco Kolk. 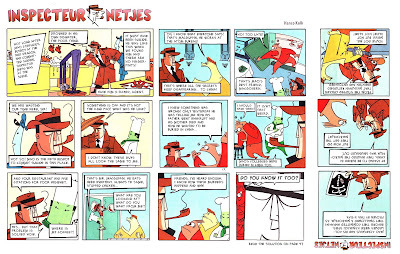 Orginally started with Peter de Wit for the Dutch weekly Eppo, he continued the strip on his own for many years and for various magazines. It is a spoof on the old 'whodunnit' concept, although many of the detective puzzles actually make sense (as well as being quite satirical). I think the strip (which has many samples availabe) would be perfect for any magazine or anthology. Hanco's modern Hirschfeld-influenced style works a treat and the whole thing holds up really well.